Navi is perfect. She has pale blue skin and a mane that flows through water like a moonbeam. Her hooves are dainty and gold, and in her finery she looks fit to be queen. King Hagan, with whom she doesn't use a title, bestowed royal jewels upon her that are imbued with ancient magic. I expected her to react to that information– wide eyes, a sharp breath, a twitch of her tail, something. But she accepted the gifts and her duty as Librarian in her typically stoic manner. To most Neopians that would sound like a boring job, but no one loves books as much as Navi. And for her to be surrounded by a mere fragment of Fyora's vast collection... I just don't understand why she isn't more excited about our journey! "Is it because I'm going with you?" I asked for the third time during our packing. Navi tied her satchel and looked at me with mild irritation. "No, Nene, I am honestly glad you wish to accompany me to the library. Believe it or not, I am slightly worried we will not arrive in a timely manner." I almost snorted. "As if you've ever been late! King Hagan said the directions are in that scroll and your final test is to decipher it before the full moon in a week's time." "Precisely," Navi said, "we are in a race against time. My entire life, nay, my entire existence will mean nothing if I do not locate that archive." She paused, blinking slowly. "Do you know why he is entrusting me to guard it?" 'Because it's ancient and you already act like a cranky sea hag,' I thought. If I had said that she would've looked scandalized. Instead I shook my head. "The Maractite Arcanum is the second-oldest library in all of Neopia. It holds records from before the Lost Desert was discovered." Her eyes held a glimmer of wonder as she went on. "Every scholar knows the story of how Queen Fyora hid some of the most powerful texts beneath the waves so no one would find them. But a faction dedicated to unlocking those secrets was formed, appropriately called the Seekers, and as new worlds continued to be discovered the Faerieland library began to overflow. The Seekers approached her, Hagan then their Grand Master, and pledged to guard that knowledge for eternity. They swore a blood oath to Fyora that they would never utilize anything they learned... because the knowledge stored there could end Neopia." I rolled my eyes at how melodramatic she sounded. "Reading a book never destroyed anything." "Clearly you have not read the Tablet of Horrific Curses," Navi countered, scoffing. She took one last look around our room, a rather cramped chamber connected to the castle basement via a maze of waterways. My theory is it was a dungeon back in the day and King Hagan had it slightly remodeled to accommodate his esteemed aquatic pupils. When Navi started out as an apprentice scholar, her intention wasn't to become a Librarian, she just wanted to learn things. She had an aptitude for minor magic and King Hagan was impressed enough to take her under his wing, literally. This all happened two years before I came to live with her, before I was discovered by a trade vessel floating nearly lifelessly among the waves. Sometimes I wish I remembered what happened before then, but I'm so thankful for having Navi as my sister that I don't want to recall something could separate us. We set off with a little fanfare at our tails. My favorite court musician gives me his coral pan flute and I try playing it until Navi stops me with a glare. We swim in complete silence, our fins easily pushing through the vast sea of Neopia. I realize I haven't seen Navi open the scroll in my presence. "Where exactly are we going?" I ask. "East," she says plainly. "I believe the library lies between Brightvale and Maraqua." "You believe?" I repeat. "If we don't know where we're going, we could get lost. I don't want to run into a glacier from the southern wasteland." "Then it is a good thing we are not going south." My nostrils flare at her retort. "But honestly, do we have a map?" She gives me a glance that says "of course, do I look like a dolt?" and I don't say anything else for a while... until I get hungry. I rummage through my satchel and indulge in a papaya with seaweed. King Hagan's personal chef liked experimenting with aquatic food and I was often his taste-tester. "Want one?" I offer, but Navi shakes her head. She eats like a Pteri. More silence. I begin contemplating what this journey has in store for me. Am I destined to follow my older sister forever? In all honesty there weren't many opportunities for me in Brightvale, but now we're on the way to Maraqua where I was born. I'm only assuming, of course– I am a Maraquan Uni, after all, and from what I've been told we're all born there. A magician named Kauvara managed to bottle the essence of the undersea kingdom and successfully transform certain species such as Gelerts, Ixi and Usuls. I think it'd be difficult for a land-dweller to adapt to living underwater. There are no flowers, no trees, no great plains of grass. No clouds, no weather aside from the occasional cyclone, and no open sky. From beneath the surface it looks just like another ocean of shimmering blue. The further we go from land the darker the water below us gets. Navi keeps contentedly swishing her tail up and down as if the increasing void doesn't bother her. I start drifting toward the surface where the sun dances over us. Apparently she is just now noticing I've left her side and raises an eyebrow at me. "What are you doing?" "I don't like being unable to see the floor. Anything could be down there..."
Navi smirks a little. "Like what?" "The... Chasm Beast." Before she snorts her amusement I go on. "I read in one of your books that Lady Isca accidentally summoned it during the Battle for Maraqua! That means it could be anywhere!" "We are still many miles from Maraqua." "And there are those evil water faeries, the Drenched... In Lord Jacques's tale he recounted that they tortured him!" Navi shakes her head pityingly. "You have been reading too many unofficial biographies. Once we settle in to the library you can read hundreds of real historical accounts." "If we make it there alive..." I mutter. We keep swimming and after a few more hours the light on the surface begins to dim. "Navi..." I try to keep my tone urgent instead of panicked like it really is. "The sun's starting to set. We won't be able to see anything at night. Where are we going to sleep?" "Relax, sister," she says with a small smile. She opens her satchel and out comes her pet Quetzal. "Ugh, you brought that useless serpent but not a map?" Calling him useless makes her frown. "Hex has been my friend since before I met you. I was not about to leave him all alone in our empty old room." She turns her nose in the air before uttering some strange words, one of her spells. It makes the colorful Quetzal glow quite brightly. He must have a lot of energy from napping during our entire trip because he swims fast figure-eights around Navi before lighting the way ahead of us. The sun has fully set, and we're still lost. I make a point not to tell my sister I told her so. We notice the water becoming less dense as Hex illuminates a sand shelf teeming with greenery and coral. A staragus is about to have an encounter with an urgoni and it probably won't like that very much. Ghotis are fluttering around while lellefisks chase one another. Since there are this many petpets out in the middle of the sea I feel safe resting here for the night. Once we settle in the petpets begin examining us. I'm looking over them thoroughly, too, because I've never seen some of the species that are hovering. "That is a snarhook," Navi informs me. "That is a gracklebug. That is a stego. The one with tusks is a gruslen." She tells me that over time some of the petpets have adapted to aquatic life. Others were experiments and still others became Maraquan via a magic paint brush, then abandoned. The last bit makes me sad; although I don't own a petpet, I'd never just leave one to fend for itself. 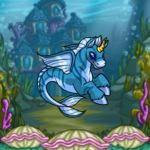 As if Fyora were listening to my thoughts, or whoever is responsible for bestowing petpets, an orange creature with blue horns and a green mane appears. It's the only one of its kind and it stares at me with large yellow eyes. "Navi, what's this one?" She doesn't know and I can tell it bothers her– she prides herself on being able to answer any of my questions. She removes a magical book and quill from her satchel and closes her eyes, transferring her mental image of the cute creature onto the paper. I've always wondered how that book stays dry. The orange petpet follows us at a distance as we continue onward. When dawn breaks Navi finally shows me the scroll. It's made of maractite and seems to reveal a map, but it's a strange one. There are three dots in a line– green, red and yellow from left to right, with a space between the green and red ones. "The words around the edge are a spell I believe reveals the library once you are in the right place." There she goes again speculating instead of actually knowing. She reads my expression and says, "Hagan would not have given me this challenge if he did not think I could overcome it. I will find that library even if it takes me the full week." "Well, we don't have enough food to last any longer than that, so we should stock up in Maraqua. And maybe someone can tell us what this petpet is." To my surprise Navi agrees with the plan. We change course and follow a current toward New Maraqua, arriving around noon. A huge gate marks the entrance to the city and two guards swim out to meet us, an Eyrie and a Jetsam. Navi has an "I answer to no one but the king" token and we head for the castle where King Kelpbeard appears to greet us. She doesn't use his title, either. We are given lavish accommodations even though we keep saying we can't stay. Then we join him for lunch and receive a tour of the city. Admittedly Maraqua is fascinating– everything is made from coral and shell and I've never seen such aquatic diversity among a community. Navi shows Kelpbeard the map while I float off to the side, but I can see his expression and he looks perplexed. She then asks him about the orange petpet and I learn it's called a gallion. "It followed you all the way here from the Central Shelf?" King Kelpbeard asks. "Yes, and it was the only one we saw," Navi answers. "It must have been lost. Gallions are supposed to be land-dwellers from Meridell. To have found one down here means—"
"Someone abandoned it..." I interrupt. I don't even apologize, I just gaze at the colorful beast with such pity it actually floats toward me and touches my nose as if I'm the one who needs to be consoled. Right then and there I decide it's coming with us. Navi gives me a silent nod of approval.